The acoustics of an opera hall has changed dramatically within the last 100 years. Until the end of the 19th century, mostly horseshoe-shaped halls were built with acoustically high-absorbing wall and even floor areas. Likewise, the often used boxes had fully absorbing claddings. That way the reverberation in these venues was made low and the hall was perceived as acoustically dry, e.g. the opera hall in Milan. 100 years later, the trend shows opera halls with more live and higher reverberation, preferred now for music reproduction, e.g. Semper Opera in Dresden. 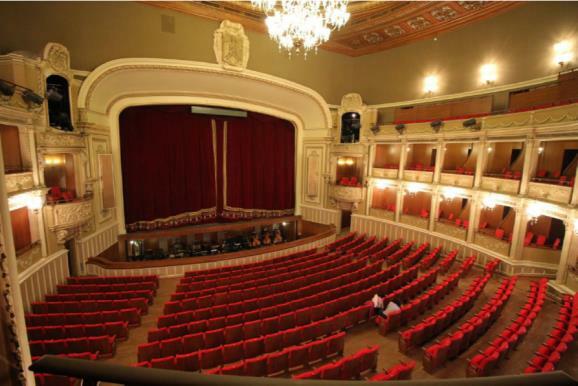 This desire to enhance the acoustic liveliness in the Opera House in Bucharest led to renovation work in 2013-2014. The Opera House was built in 1952-1953 for around 2200 spectators and it followed a so-called style of “socialist realism”. This type of architecture was popular at the time, when communism was new to Romania, and the building has therefore a neoclassical design. The house was looking inside the hall like a theatre of the late 19th century. The conditions in the orchestra pit for the musicians, as far as mutual hearing is concerned, were bad as well. So, construction works took place in order to improve room acoustical properties for musicians and audience. All the absorbing wall and ceiling parts were substituted by reflecting wood panels, the carpet was removed and a parquet floor was introduced. As a result, the sound does not fade out anymore as in an open-air theatre but spaciousness may be perceived now. The height within the pit in the covered area was very small. The space in the covered area of the pit was highly overdamped by too much absorber. 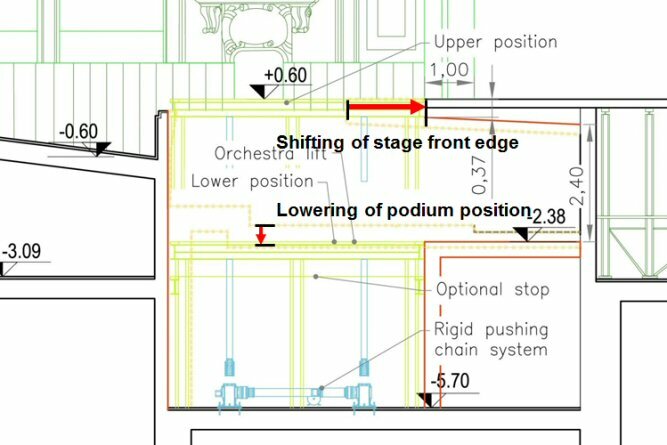 The ratio between open area and covered area is now better by shifting the front edge of the stage floor to the back: Depth of opening is now 5.1 m, depth of cover only 3.1 m.
The height within the pit in the covered area is increased by lowering the new movable podium. The walls and soffit in the pit are now generally reflective, broadband absorbers can be placed variably at the back wall in the pit. After an elaborate investigation by measurements and simulation on site a prolongation of the reverberation time of 0.2-0.3 s was reached to actual values of about 1.3 to 1.4 s.
Together with alterations of the geometric situation of pit, the acoustic properties of the hall are now very satisfactory for musicians, singers and the audience. Beside the reverberation time, other room acoustical measures such as C80, Support, Strength, etc. have been improved significantly.